This is about as close as M gets to using humor. 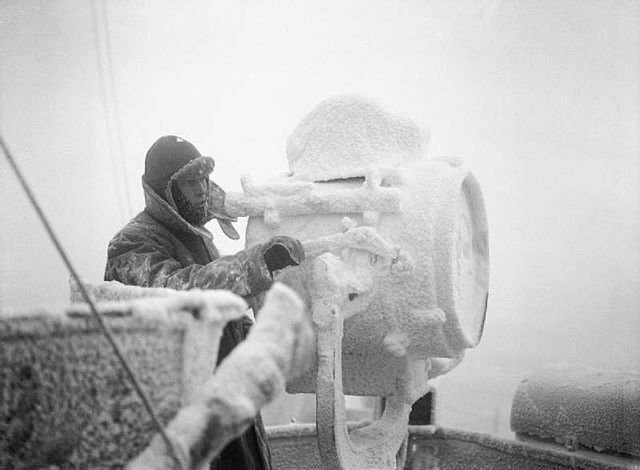 He is referring to the Arctic convoys of World War II – an operation where Allied ships brought supplies to the Soviet Union. These convoys often met with severe weather on their trips, as well as German opposition. “HMS Sheffield frost” by Coote, R G G (Lt), Royal Navy official photographer – This is photograph A 6872 from the collections of the Imperial War Museums (collection no. 4700-01). The above photograph is from one of those convoy missions and likely shows what M had in mind when making the reference. One of the things that is really good about Fleming’s writing is that most of the references are framed in enough context so that even if you do not specifically know what it is, you still get it on some level.